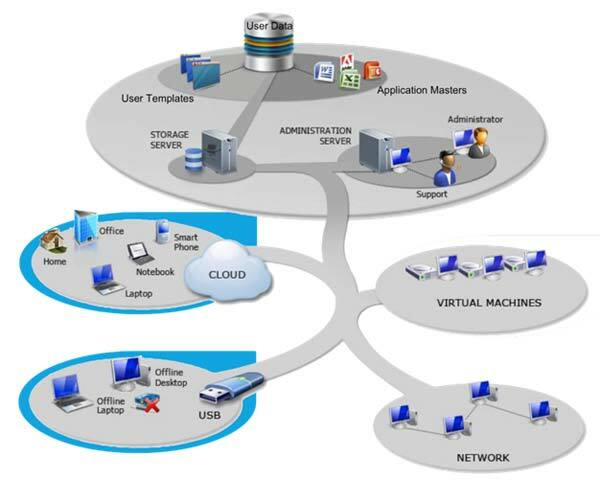 Benefits of Desktop Virtualization for Businesses, is a series of article. In this part, have written about the Manufacturer and Products for Desktop Virtualization. The first topic of this series on Benefits of desktop virtualization for businesses starts from this hyper-linked topic and was continued to this topic. As we have said before, the series on Benefits of desktop virtualization for businesses is like a case study, not really like usual blog articles. VMware standing as a provider of virtualization solutions. For some long time as a pioneer on Virtualization solutions. Virtualization and VMware is almost equated togather. The ever louder outcry from consumers for desktop virtualization, virtualization let the market to be increasingly becoming more popular. The interest in securing market share in this sector and to strengthen its position as a provider of virtualization solutions, is now continuing more towards VMware. Other companies such as Microsoft, Oracle, Citrix, Parallels and many more has solutions for Virtualization. Citrix is ? ?the market leader in desktop virtualization with 19% market share, followed by Microsoft with 15%, and VMware with 8%. Over 60% of companies have not yet started their desktop environments to virtualize. XenDesktop: Comprehensive desktop virtualization and VDI. XenApp to virtualize Windows® applications and deploy as an on-demand service. XenClient Virtual desktops to go. Citrix Receiver: The first self-service interface for delivering enterprise applications. GoToMyPC: remote access to your Mac or PC – from any location. Windows Virtual PC: For Home and Small Office, the Windows XP mode 7 Professional and Windows 7 Ultimate is available for Windows, a pre-installed virtual Windows XP environment ready. VMware View: solution for desktop virtualization. VMware ThinApp: product for virtualizing application programs. VMware Workstation: Product for virtualization of operating systems. VMware ACE: Extension of the workstation (enforcement of security policies possible). VMware Player: Runs VMware Images. Zimbra: platform for virtualization and portability across private and public clouds. VMware Mobile Virtualization Platform (MVP): Software level which is embedded on the mobile phone. VMware Fusion: MAC product for virtualization of operating systems. Oracle Corporation, headquartered in Redwood Shores, USA was founded in 1977 by Lawrence Joseph Ellison, Bob Minor and Ed Oates. With the acquisition of Sun Microsystems, Oracle is now also operates in the hardware sector. Virtual Desktop Infrastructure: Provides a complete solution for the management and access to virtualized desktop environments hosted in the data center. Secure Global Desktop: Provides access to full-screen desktop environments, allowing administrators the freedom to use a single solution to provide access to server-based applications and server-hosted desktop environments. Sun Ray Clients: Are simple, highly reliable, low-power devices that are ideal for displaying server-hosted virtual desktops. VM VirtualBox: Is a powerful cross-platform virtualization software for x86-based Systems. Desktop: Improve the productivity and work on multiple platforms – without additional hardware. Workstation Extreme: First workstation solution with dedicated graphics for virtualized environments. We are not mentioning other solutions, including virtualbox, which are not intended for a typical high load server usage with more administrative features for better security. We will continue the series on Benefits of Desktop Virtualization for Businesses periodically and update, interlink the articles for better accessibility. This Article Has Been Shared 3530 Times! Benefits of desktop virtualization for businesses is a multi part, case-study like topic. Management and Flexibility part, is the last but not the least part. Cite this article as: Abhishek Ghosh, "Benefits of Desktop Virtualization for Businesses : Manufacturer and Products," in The Customize Windows, November 25, 2013, April 26, 2019, https://thecustomizewindows.com/2013/11/benefits-of-desktop-virtualization-for-businesses-manufacturer-and-products/.